The sounds of women singing to the strains of violins fill the clear air of Bulgaria’s Rila mountains as 2,000 white-clad pilgrims move gracefully in a series of rhythmic meditation exercises. 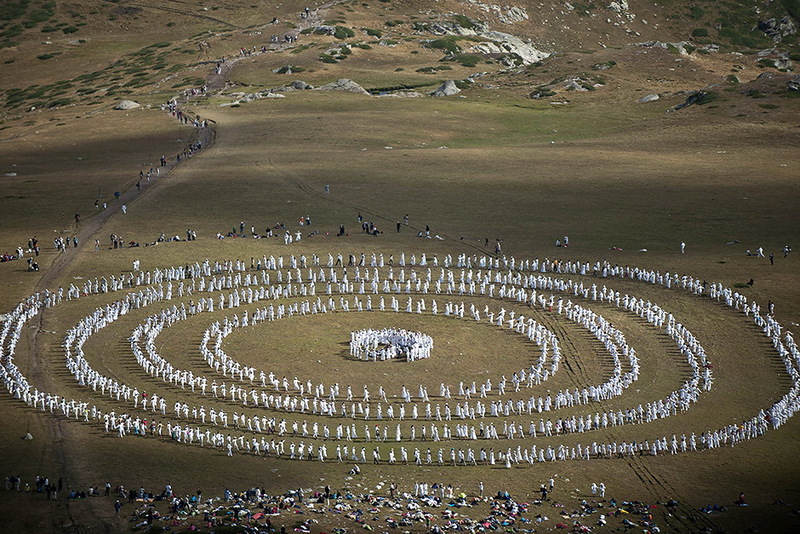 The highlight of the day is “paneurhythmy”, a dance-like ritual that pilgrims perform in large concentric circles, creating a striking image on the verdant mountain plain. The esoteric society combining Christianity and Indian mysticism believes that positive cosmic energy is at its strongest here around August 19 and that paneurhythmy will help them channel it and spread it around the world. “We come to Rila before the feast to cleanse ourselves from the mud of everyday big-city life with the energy of this place and with positive thinking,” Alexandrina Stoilova, 80, told AFP, adjusting her wide-brimmed white hat before joining in the rituals. The pilgrims, who address each other as “brother” and “sister”, camp near the Seven Rila Lakes, greeting the sunrise with prayers and meditation before hiking up to the nearby plateau to practise paneurhythmy. They also attend lectures to open their souls and fill them with positive energy. The spiritual school, founded by Bulgarian theologian Peter Deunov in 1897, emphasises brotherly love, healthy habits, positive thinking and living in harmony with nature. It does not keep track of its numbers but is believed to have tens of thousands of followers worldwide, possibly more. Deunov — also known as Master Beinsa Douno — began developing paneurhythmy and taking his followers camping to Rila in the 1930s, by which time they numbered around 40,000. The Bulgarian government later recognised the positive health effects of his “cosmic rhythm” exercises, and paneurhythmy was experimentally taught in a Sofia school as a physical education option. But World War II and the installation of communist rule in Bulgaria in 1944 drove the movement underground. “Paneurhythmy was practised in secret and people still came to Rila even if it was officially banned,” said 68-year-old Hristo Madjarov, one of the movement’s lecturers and a long-time follower. Authorities closely monitored meetings in Sofia, and the secret police often questioned members, Madjarov added. Even now, the Universal White Brotherhood remains at odds with the Christian Orthodox Church, which has dismissed it as a sect. After the fall of communism in 1989, however, the brotherhood was officially registered as a religious movement, and by 2007 Deunov had gained so much stature that he ranked second among the greatest Bulgarians in a 2007 state television poll. His movement has also grown abroad: from France — where Deunov’s disciple Mihail Ivanov, better known as Omraam Mikhael Aivanhov, first spread his teachings — to Belgium and Switzerland, and as far as Canada, Mexico, Iceland and the Democratic Republic of Congo. “This is my second time in Rila, and I would like to keep coming, as dancing paneurhythmy in the mountains here is a lot different from practising it back in Switzerland,” David Gerard, who joined the brotherhood 37 years ago, told AFP. Maria Jesus, a 43-year-old economist from Granada, said she had practised paneurhythmy in Spain for eight years and that it gave her “spiritual harmony and vitality”. In a new study published this month, Bulgarian Sports Academy professor Lyudmila Chervenkova noted the benefits of attending just a six-month beginners’ course in paneurhythmy, whatever the learner’s age. Deunov’s simple exercises improve balance and physical endurance while lowering aggression levels, boosting optimism and battling depression, she found.